George Herman “Babe” Ruth, the legendary baseball slugger, participated in a protest by German-Americans against the Nazi persecution of Europe’s Jews. The protest was organized by Dorothy Thompson (1893-1961), the first American journalist to be expelled from Nazi Germany, who was once described by Time as one of the two most influential women in the United States, second only to Eleanor Roosevelt. In the autumn of 1942, Thompson contacted the World Jewish Congress with the novel idea of mobilizing German-Americans to speak out against the Nazi persecution of the Jews. 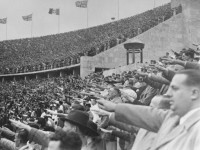 A German-American protest against Germany–would be especially significant in view of the pro-Nazi sentiment in some segments of the German-American community. Just a few years earlier, more than 20,000 supporters of the German American Bund had filled Madison Square Garden for a pro-Hitler rally. The World Jewish Congress agreed to foot the bill for publishing Thompson’s anti-Nazi statement as a newspaper advertisement. During the last week of December 1942, the “Christmas Declaration by men and women of German ancestry” appeared as a full-page ad in the New York Times and nine other major daily newspapers. The names of fifty prominent German-Americans adorned the advertisement. Among them were several notable academics, such as Princeton University dean Christian Gauss and University of Maine president Arthur Mauck. Leading Protestant theologian Reinhold Niebuhr, news correspondent William Shirer, and orchestra conductor Walter Damrosch appeared on the ad, as did Freda Kirchwey, editor of the political newsweekly The Nation, and Oswald Heck, speaker of the New York State Assembly. Ruth was undoubtedly the best-known of the signatories. Sources: Wyman, The Abandonment of the Jews, pp.63-64; Medoff, FDR and the Holocaust, pp.137-138.